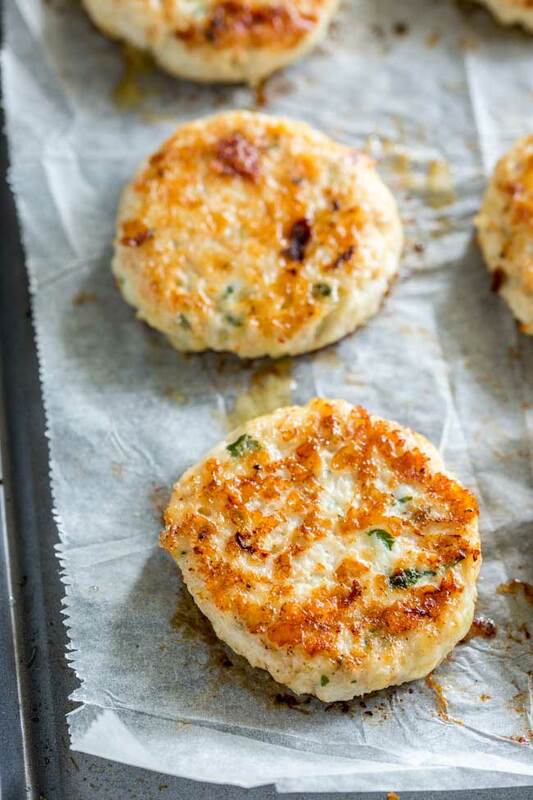 Everyone will love these Cauliflower Cheese Chicken Fritters. Not only do they make great party finger food they they are perfect for a mid-week family meal. Light, crispy, and packed with cauliflower, these are always demolished. This is a recipe I shared back in 2014, when I knew very little about taking photos, even less about writing blog posts and zero about SEO and site optimisation. 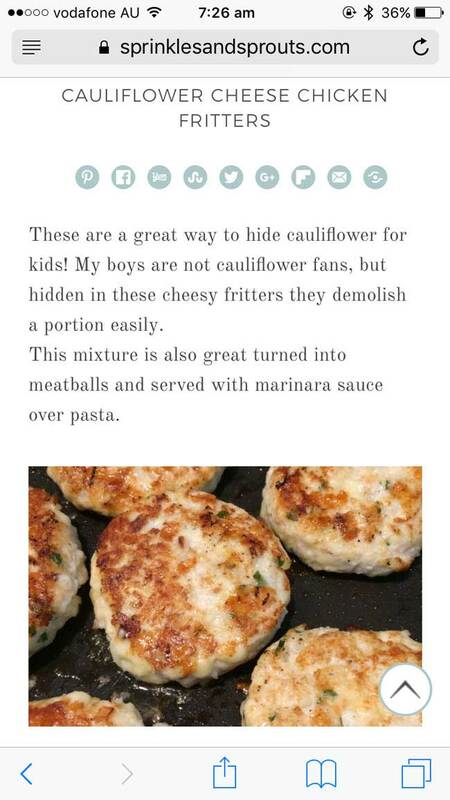 “These are a great way to hide cauliflower for kids! 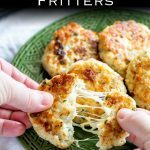 My boys are not cauliflower fans, but hidden in these cheesy fritters they demolish a portion easily. No mention of what they were called, no hints about cooking them, no funny story, nothing. Just 3 lines and a recipe. So today I am re-writing this, adding some new updated pictures and pulling it to the top of my blog. As I said back then, these are great for kids as the cauliflower is hidden away, it binds everything together but doesn’t scream ‘I’m here’. My boys cannot stand cauliflower but they will happily eat these fritters. The cheese and the chicken mince bulk them out, make them taste delicious and turn a boring vegetable into a scrummy dinner. After I had taken photos of these Cauliflower Cheese Chicken Fritters I gave away a batch to a darling friend. Her girls loved them, so she made them again herself using some turkey mince (ground turkey). They were a big hit, so feel free to substitute in turkey mince. I have given two methods for cooking these chicken fritters. My preferred method is to start them off in a frying pan and then transfer them to the oven. This way you get a nice crisp outside and the inside is juicy and delicious. 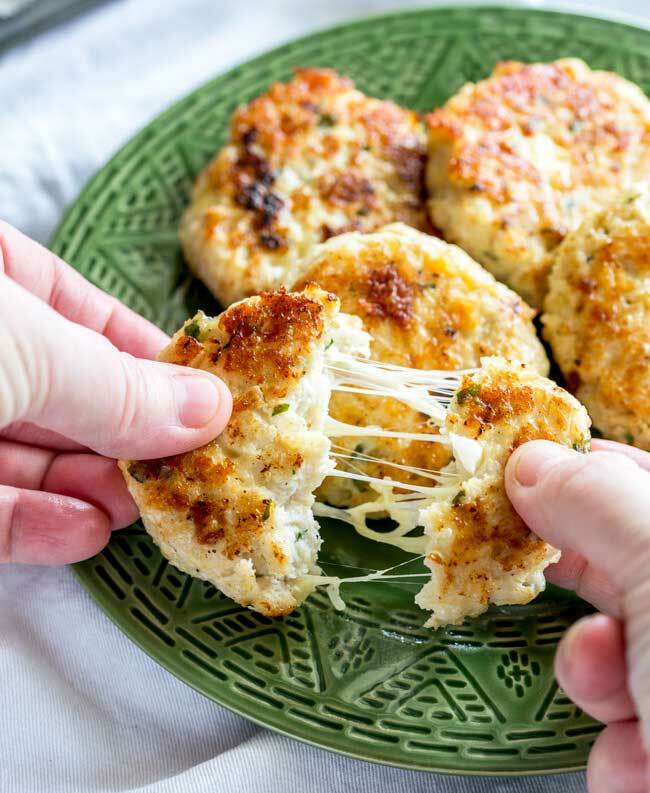 p.s if cheese and chicken is your jam, then check out these amazing Goat Cheese Rosemary Baked Chicken Meatballs from the lovely Madison over at A Joyfully Mad Kitchen. 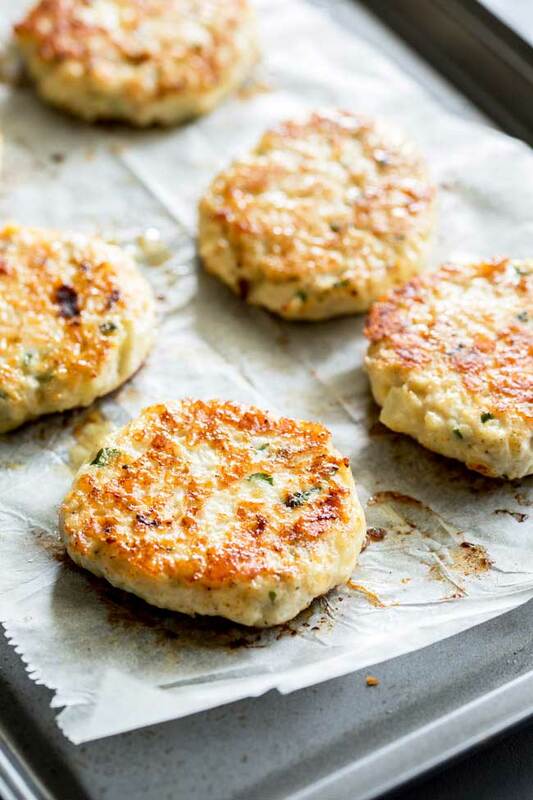 If you love this recipe for Cauliflower Cheese Chicken Fritters why not pin it for later. 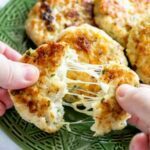 Everyone will love these Cauliflower Cheese Chicken Fritters. These are perfect for a mid-week family meal. 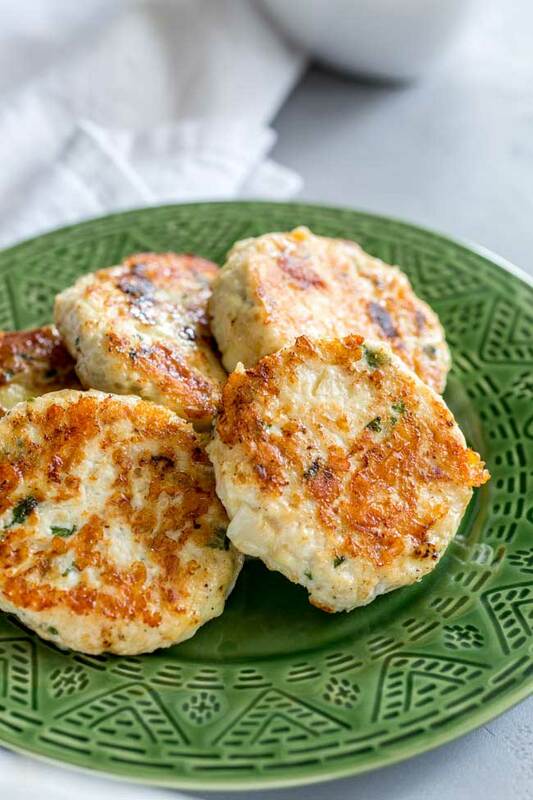 Light, crispy, and packed with cauliflower, the whole family demolishes these fritters. Cut the cauliflower into florets and cook until tender and soft. Drain and allow to cool slightly before chopping into small pieces. Add the remaining ingredients to the cooled chopped cauliflower. Mix well until combined and the cauliflower has broken down further. Use a 1/4 cup measure (or 3 tbsp) and divide the mixture into fritters. You should get 16 fritters out of the mixture. Place a large heavy based frying pan over a medium heat. Add a splash of oil and cook the fritters for a minute until golden, flip and cook on the other side. Remove the fritters to a lined baking sheet and cook the remaining mixture. Once they are all crisped baking for 15 minutes until cooked through. Alternatively you can cook them completely in the oven. Pre-heat the oven as above. Place the raw fritters on a lined baking sheet. Spray with oil and bake for 20-25 minutes turning once. Add a splash of oil and cook the fritters for 4 minute until golden, then flip and cook on the other side for a further 3/4 minutes. If you love food why not subscribe to my newsletter, I will drop you an email every now and then, just to say hi and send you a couple of recipes think you might love, like these Cauliflower Cheese Chicken Fritters. Oh I am so pleased you and the family enjoyed them Judy. Hi there, My husband saw these and so I immediately opened the recipe as they looked delicious. The nutrition facts say per serving but doesn’t specify what a serving is. Is it for the whole recipe? Thanks! The recipe makes 16 fritters, for a main meal I tend to serve 4 each for a main course, or as an appetizer just 2. So the recipe will easily serve 4 people for a main, 8 for an appetizer. If you want to reduce the recipe, the servings box at the top of the recipe card is customisable. So you can change the servings number and it will scale the recipe for you. Some things don’t scale well but it can be handy if you want to double/half a recipe etc. I hope that helps and that you and your husband enjoy them. I have frozen the mixture before I make the patties and also frozen the uncooked patties. It defrosts well although the mixture is slightly softer after defrosting so I found the larger patties aren’t quiet as good for finger food. They are better made into smaller parties or used as part of a dinner with a knife and fork. 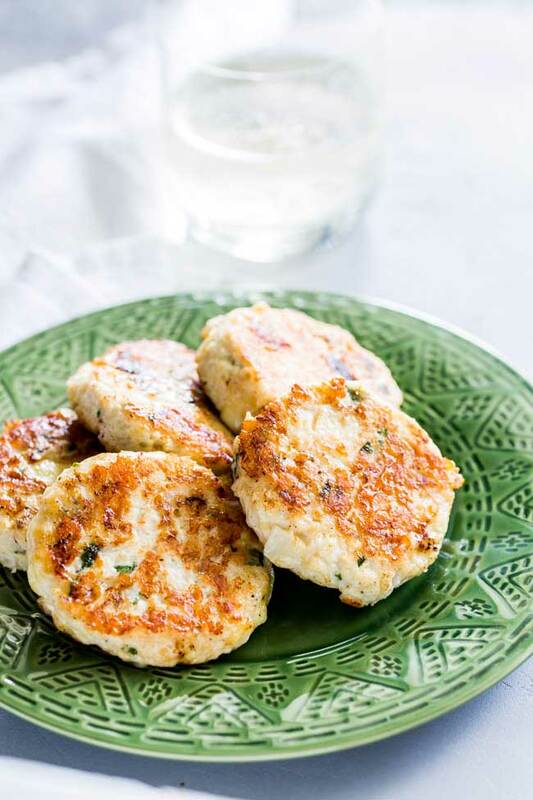 The cooked patties, freeze extremely well and are great warmed in the oven. The buffalo dipping sauce is an inspired idea! Just made these. Delicious! I sub’d gluten free breadcrumbs and ommitted the egg due to allergies, still turned out perfect! Thank you thank you! Nice Post…Thanks for sharing this yummy post with us..
Every one like to eat some yummy and healthy food…Share more yummy recipes with us. 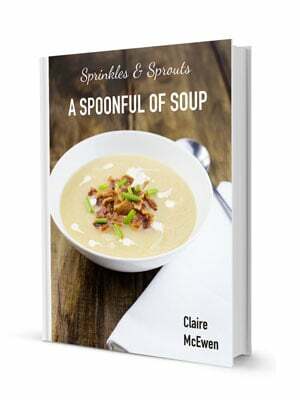 Nice recipe… thanks for sharing this yummy and healthy recipe. The kids loved it. How long did you cook them for in the frying pan? If you don’t bake them, they only need about 4 minutes on each side. Also were they quite solid? If the ground chicken had been undercooked they could well have been too soft and fallen apart.